You are viewing the archive for the ‘Fish’ tag. I usually don’t make recipes that I see on the TV. After watching Alton Brown making fish taco (recipe here) in Good Eats, I jumped right in to construct similar fish tacos made from pan grilled fish doused in cilantro. I love cilantro and usually don’t like authentic fried fish in fish tacos. Alton used a classic flavors by adding garlic and lime to cilantro marinade, while adding a optional shot of tequila to intensify the flavors. Tilapia, a neutral fish with a bland flavors is perfect for cilantrofic fish taco. Also, it was the only fish left in my freezer.For one pound of tilapia fillets, I added marinade made from following ingredients. Blend all the ingredients to paste. 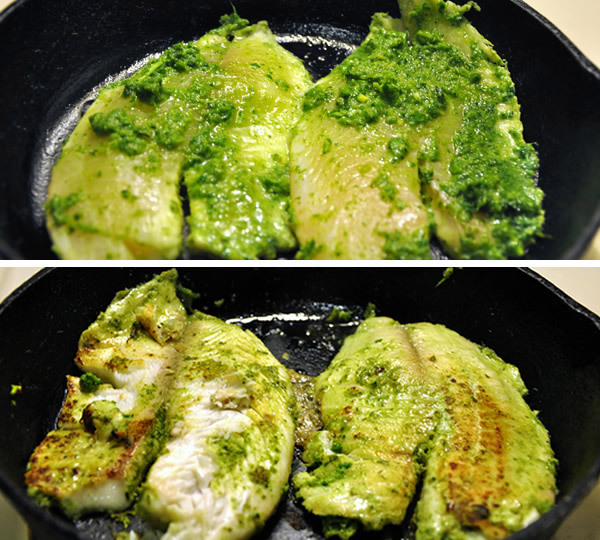 Marinade tilapia in it for few minutes to hours. Feel free to change the amount ingredients slightly based on what you want from that meal. Heat a pan (cast iron pan here). Add some oil and cook fish for just a couple of minutes on each side. The fish surface will change to golden brown color with slight charring. You will know fish is done when you see translucent fish just changes to an opaque color and gets flaky texture. One of the important things to remember is fish cooks very fast and overcooked fish is chewy and not at all appetizing. I opted to make my own tortillas. In this version of soft flour corn tortillas, instead of adding lard, I added oil because my guests didn’t eat pork. I flavored tortilla dough by adding pinch of salt, ground coriander seeds and ground dried cayenne pepper. Even though coriander seeds come from cilantro plant, it has entirely different flavor. Well, I donno if I can still technically claim that my dish is more cilantorfic by adding coriander. Contrary to what I expected, I found making tortillas was the most difficult task in this entrée. I added flour and water in 2 to 1 ratio with 2 tablespoon fat per cup of flour. I also realized that it’s difficult to roll out perfectly circular tortillas, rolled tortillas stick to surface even being dusted with flour, and it’s cooked on a high heat within 30 second, each side. Sorry Alton, your recommendation of 4 minutes per side resulted in crispy tortilla/pita chips for my hummus. 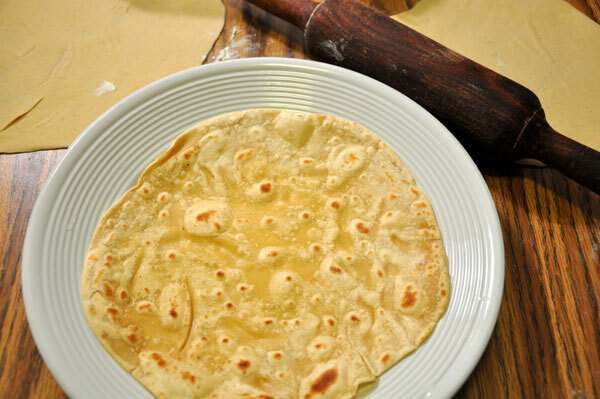 It’s amazing how seemingly simple things like making a perfect tortilla can be most challenging – well – a good topic for a separate future post. 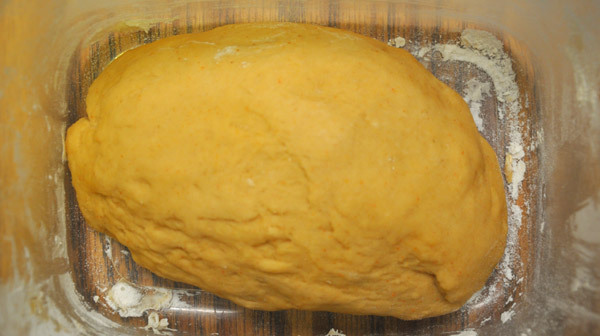 I made fresh Mexican fresh cream, known as crema, or white sauce for fish taco by making yogurt out of cream in a yogurt maker (see my saffron yogurt post). I seasoned it by adding a pinch (or few) of cumin/coriander, cayenne pepper and salt. 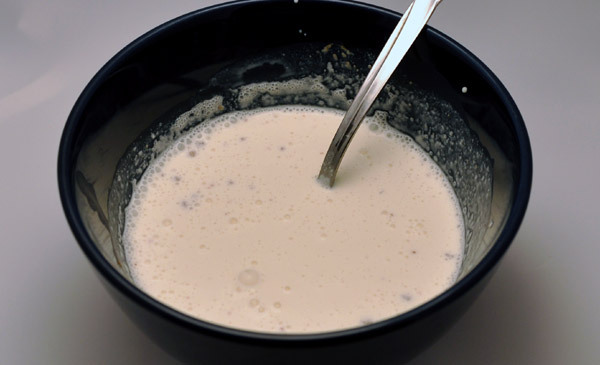 If you don’t have a yogurt maker, add a teaspoon of yogurt in a cup of cream, mix and store in warm place for 1 hour. If you really don’t feel like making cream yogurt, get a cup of Greek yogurt and add the seasonings. Also, chipotle chili in adobo sauce like the ones I used for making chipotle chile verde would go well with the sauce. Sadly, I didn’t have it when I was making fish tacos. I love guacamole in my tacos. I used avocadoes, lime, onion, and tomatoes. 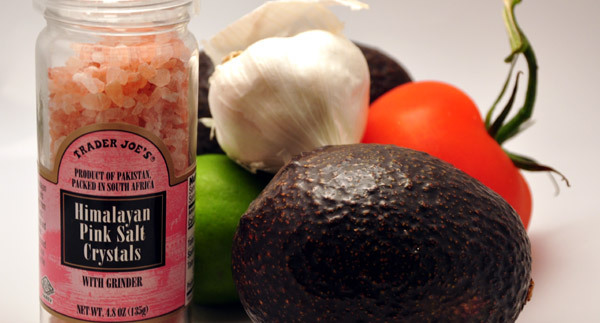 Instead of the regular salt, I used Himalayan pink salt (also known as black salt) because of its tangy pungent flavor. Honestly, I am not sure if the pink salt added any flavors, but it didn’t ruin the guacamole an we all guest loved its taste. 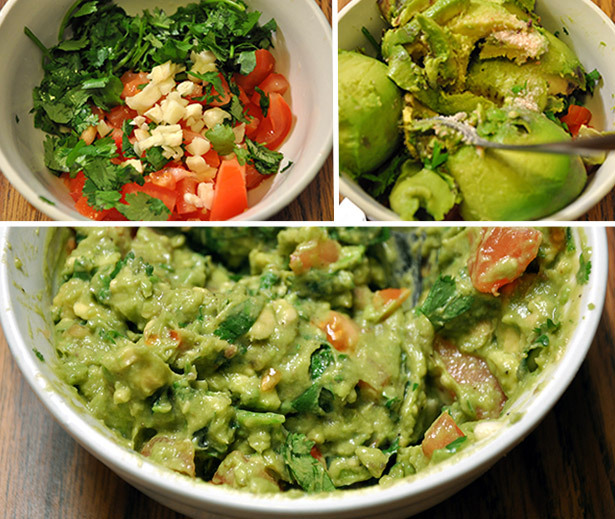 Guacamole is easy to make and best when made fresh. If you are expecting guests, you could do time consuming steps, such as chopping onions, tomatoes cilantro and garlic etc, ahead of time. Wait and add (and mash) avocados, lime juice and salt just before eating. I find crunch from vegetables like cabbage an integral part of fish taco experience. 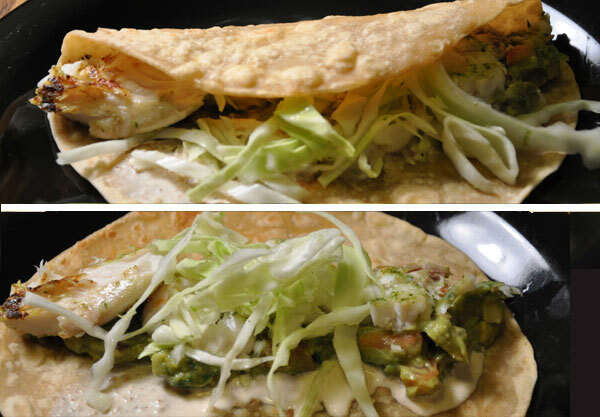 A silky texture of soft tortilla, flaky fish texture, and creaminess of sauce/guacamole is balanced with a perfect crunch. 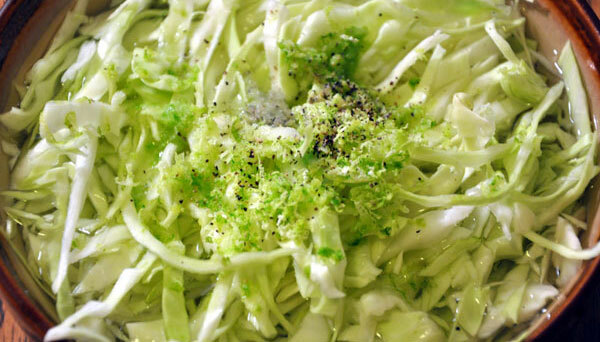 I immersed shredded cabbage in lukewarm water, and added a pinch of salt, few pinches of lime zest and freckles of black pepper. After immersing in water for a few minutes, throw out the water. I found adding these simple steps and ingredients made it more flavorful and brought out its bright color. 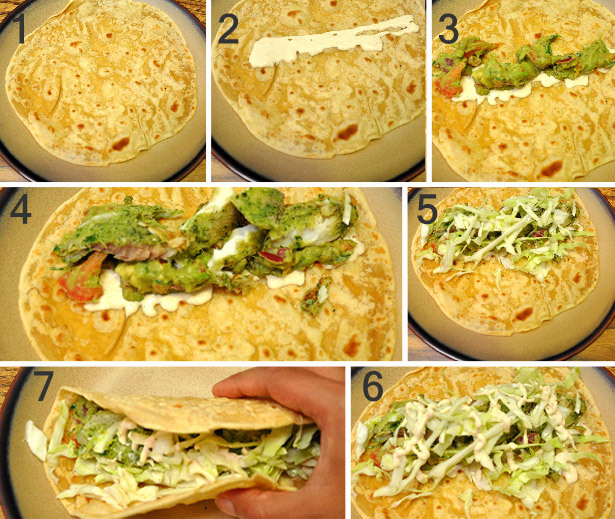 Get flour tortillas (1), add white sauce (2), scoop of guacamole (3), grilled fish (4), shredded cabbage (5), more white sauce (6), fold and eat (7).